Grelle paints the Native Americans as they went about their lives whether doing everyday chores or participating in tribal rituals. As the other braves gaze into the distance, the keeper of the pipe offers his prayers. The smoke from the pipe is believed to carry the breath of prayers to hopefully be answered. This dramatic, beautiful work by Grelle won the Buyers Choice Award at the 46th annual Cowboy Artists of America exhibit in 2011. The recipient of this coveted award is selected by show attendees holding bid books. 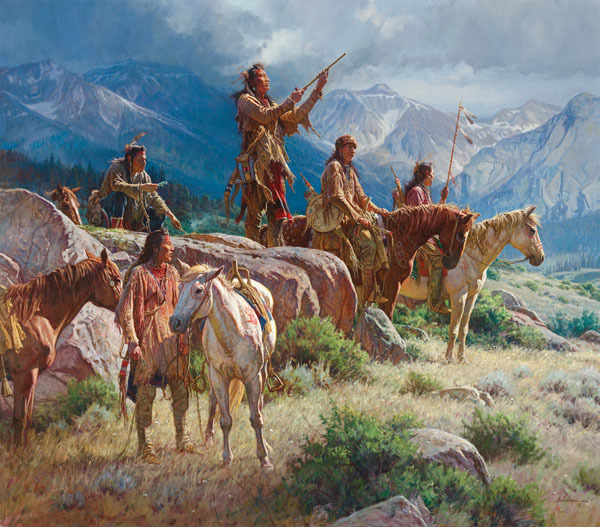 The Cowboy Artists of America is the most enduring and prestigious association of western artists in our nation.